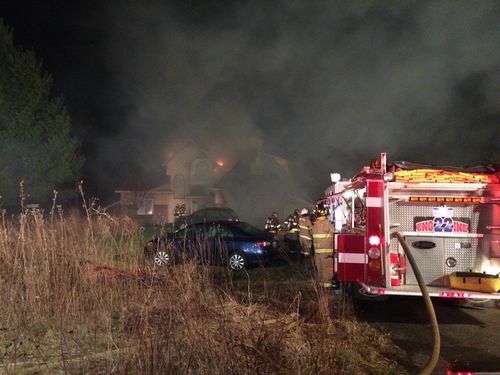 GRAND RAPIDS, Mich. (WZZM) -- Investigators are expected to return to the scene of an overnight house fire that badly damaged a home's roof, and other parts of the building as well. It happened around 10 p.m. Thursday off of Hoag Avenue, between 3 and 4 Mile Roads. That's just east of Grand Rapids. The homeowner called 9-1-1 after noticing smoke, but by the time firefighters showed up, flames were shooting from the building. Investigators believe the flames began near the garage, where a bulk of the fire came from. There were no hydrants in the area, but there was plenty of mutual aid trucking water in. Firefighters say the bigger problem was Thursday night's heavy winds.